H x W: 18.5 in. / 22.5 in. 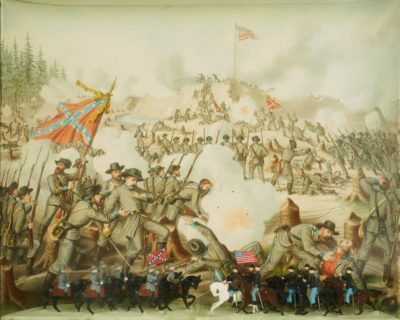 This Civil War shadowbox from the mid-to-late 19th century represents the ill-starred assault on Fort Sanders by General James Longstreet (1821-1904), a Confederate leader in almost every campaign against the Army of the Potomac, as well as in the Battle of Chickamauga and in East Tennessee. On November 29, 1863, General AE Burnside, Union leader and defender of Fort Sanders, Knoxville, Tennessee, defeated a catastrophic attempt by General Longstreet to surprise the Fort by a forward rush at first light, when objects first were made clearly visible. Longstreet believed that had he not sounded recall so soon, victory might yet have been attained.